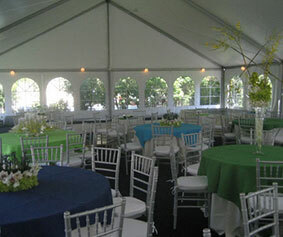 We Rent Tents for All Occasions- Weddings, Graduations, Corporate Events and More. Barry’s Let’s Rent It in West Bloomfield is SE Michigan’s leading rental company for wedding tents, graduation tents, corporate tents, backyard tents, party tents, and more. Our tent rentals are clean, weather resistant, and provide excellent shelter from the elements. If you are looking for an affordable tent rental company in metro Detroit, contact Barry’s Let’s Rent It. We’ve been a trusted tent rental company since 1982. If you’re planning an outdoor party, weather is a big concern. Why not play it safe and rent a tent from Barry’s Let’s Rent It? Barry’s Let’s Rent It has party tents of all shapes and sizes- from pole tents to frame tents to canopy tents. And all of our tent rentals include delivery and set-up. We have large and small canopies and party tents for use on patios and decks, and canopy tents of all sizes for dirt and grass surfaces. 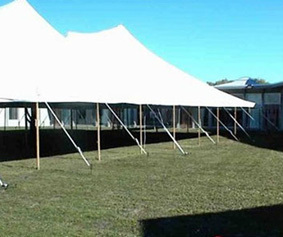 Contact us now for a great price on party tent rental in metro Detroit. How Do You Determine What Size Tent You’ll Need? Let Barry’s Let’s Rent It Help You Out! Whether you’re hosting a party in your backyard, park, golf course, parking lot, or any other open area, contact Barry’s Let’s Rent It to help you with your tent rental. There’s nothing worse than renting a tent only to find it’s too big, or too tall, or you didn’t plan for the tent stakes and lines. 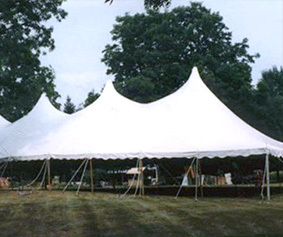 When you rent a tent from Barry’s Let’s Rent It, we can measure your space, identify any challenges like wires, overhangs, slopes, gas lines, and sprinkler heads, and make suggestions for the size and type of tent you’ll need to rent for your event. We’ve been helping party planners get the most tent for their space at a great price for over 30 years. Barry’s Let’s Rent It is your one-stop-shop for party tent rentals. In addition to our basic tents, you can rent tent and outdoor accessories to make your space more comfortable and inviting. Barry’s Let’s Rent It has a tent accessories like chandeliers, globes, heaters, carpeting, flooring, dance floors, tent pole sashes, and exit signs. Our outdoor accessories include market umbrellas, white portable fencing, and flexi-tunnels. With Barry’s Let’s Rent It in West Bloomfield, we’re more than a table rental company, we help your party look complete!